Of the volume (30,002.3 tonnes) offered for sale today, 13,920 tonnes of cotton were sold, representing 46.4 percent of the total. The average price was 14,281 yuan per tonne (down 31 yuan from yesterday), equivalent to an adjusted Type 3128 price of 15,536 (down 19 yuan). The total sold included 7,267.7 tonnes of Xinjiang cotton, again representing all of the catalogue offered from that region, at an average price of 14,595 yuan per tonne. The remainder (6,652.3 tonnes, representing 29 percent of the regional total) was composed of lots produced in eastern provinces, at an average price of 13,859 yuan. 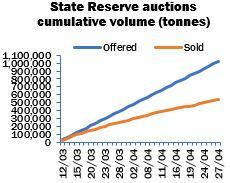 The cumulative total disposed of since the start of this year’s auction series is now over 540,000 tonnes, or 53.3 percent of the total offered.